This weekend families across British Columbia will get together to celebrate Family Day. In honour of this long weekend, we thought that we would share a little bit of our family history with you. We know that 110 years is a lot of time to cover, so we’ll keep it brief! With early projects dating back to the construction of the Hudson Bay store in downtown Vancouver, the Granville Street bridge, and the infrastructure for the Vancouver International Airport, Ledingham McAllister has long been recognized as a leader in the construction industry thoughout British Columbia. 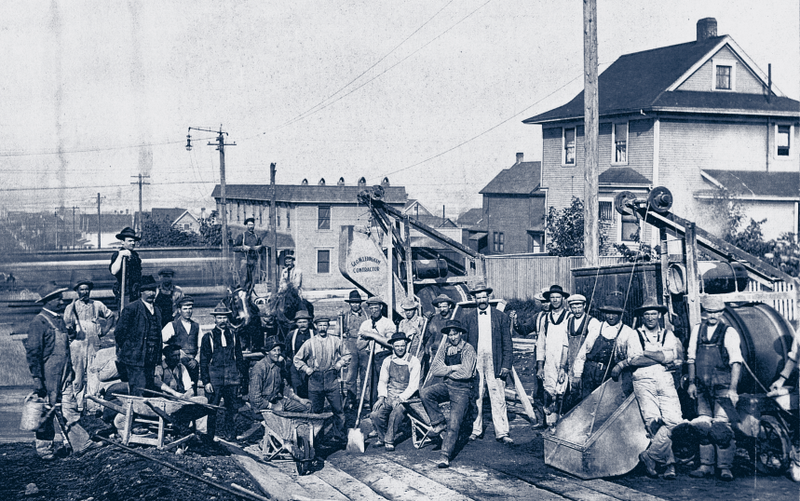 A small excavation company operated out of George W. Ledingham’s backyard would soon grow to become one of BC’s largest road building and underground utilities companies before its aggressive move to the construction of multi-family residential communities. By 2004, Ledingham McAllister had become the second largest builder of woodframe condominium homes throughout the province and is continuing its tradition of excellence by developing a solid reputation for building trendsetting high-rise towers throughout the province. For more than 110 years it has been our commitment to exacting standards of design, environmental leadership, engineering and construction that ensures homes of enduring quality and value. More than 10,000 homes later, we can proudly state that our past was built on it, and our future depends on it.